The town is divided into the following: Serrara, Fontana, Sant'Angelo, Succhivo, Ciglio, Calimera and Noia. Each of these is typologically different from the rest of the island. A lot of the island's farming traditions have been preserved in this area and the modern lifestyle continues to reflect them. The land is hilly and often furrowed by deep gorges created by rainwater. Only Sant'Angelo lies on the coast. It is a little fishing village which has to be explored on foot. The town centre is made of a dense group of low, pink houses. The houses line the narrow streets which join up in the town's little square near the natural isthmus which joins the town to the promontory - typical of Ischian towns. The main monuments are: the church of Assunta and San Michele Arcangelo, the church of the Madonna di Montevirgine, the parish church of S Maria SS del Carmine, the parish church of S Maria della Mercede, the San Nicola hermitage and the little church of S Nicola di Bari. Go for a trip up Mount Epomeo, where you can enjoy a view of the whole island, magnificent sunrises and sunsets, the Frassitielli and the Falanga. Spa centres include 'Aphrodite', 'Apollon' and 'Tropical' gardens. Most tourists prefer to go at night in order to enjoy the following morning's dawn from the mountain's summit. If you choose a night with a full moon you will be able to see Forio in the bright light, looking like an eastern city, and a satellite disappearing into the horizon. The name 'Epomeo' has a wonderful meaning: 'to view the panorama from high above'. 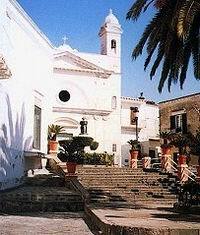 Sant'Angelo is Serrara-Fontana's only seaside town. Serrara-Fontana is mainly agricultural, lying over 400 metres above sea level, south of the massive volcano Epomeo. Sant'Angelo is a pretty little village with humble fishermen's cottages and a beautiful and unique beach, flanked by the sea on two sides. There are various trips of interest you can go on, amongst which there is the one to the valley of Cavascura, where a powerful thermal water spring gushing from the rock at a 100 degrees feeds a spa centre dug into the rock. Casamicciola town added 'Terme' to its name in 1956 due to the numerous springs found in the area. These can be especially found in 'Castiglione', 'La Rita' and Piazza Bagni where most of the hotels and spa resorts are situated. Some of the most notable are: Gurgitello, Tamburro, Oro, Argento, Ferro, Occhio and Colata. A famous and international clientele, namely Lamartine, Renan, Ibsen and Garibaldi, has always visited Casamicciola. There are few historical monuments due the continuous telluric movements (the last one was in 1883). There is the Pio Monte della Miseracordia, the first spa resort, the church of Buon Consiglio, the church of San Gabriele, the noble church dedicated to St Francis of Assisi, the church of the Immacolata, the Geophysical Observatory founded by Giulio Grablovitz. Outings to the surrounding hills, to the bottom of the craters Oglio and Cretaio or to the top of Mount Epomeo are popular. 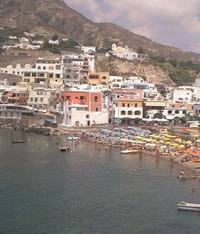 Forio is the second major town of Ischia according to population number and importance. It stretches between two promontories, Punta Caruso (at Zaro) and Punta Imperatore, between the considered most beautiful beaches on the island and into the metallic green of the vineyards which cover the slopes of Mount Epomeo, descending into a scene of incomparable beauty. It is the only town which has preserved its entire historical centre with its tiny streets, churches, sighting towers and monuments - all of which are unaltered from their original construction. The main monuments are: the church of Soccorso (pictured on one of the Italian stamps) dedicated to Santa Maria della Neve, the Torrione (big tower), the church of San Francesco da Paola, the church of Arciconfraternita’ of Santa Maria delle Grazie known as Visitapoveri, the Basilica Pontificia S. Maria di Loreto, the church of San Vito, the parish church of S Leonardo Abate, S Maria al Monte. You should visit the exotic garden of villa Gancia, the garden of Lady Walton; the troglodyte house dug into a mass of tufa and the spa gardens Poseidon. In the 1950s it was an international meeting place for show business personalities (Luchino Visconti, Pierpaolo Pasolini, Sir William Walton, Eduardo De Filippo, Liz Taylor and Richard Burton), writers (Elsa Morante, Alberto Moravia, Renato Guttuso, Auden, Pablo Neruda), politicians (Pietro Nenni) and the jet-set (Jackelin Kennedy, Aristotele Onassis) and many others. The wavy shoreline of Forio allows bathing not just from the beaches but also from other more secluded spots. You can easily get to Zaro or to the only Bay of Sorgeto near Panza which, due to its hot water wells, is the favorite place in any season for a midnight dip. The town of Lacco Ameno is situated on the northwest part of the island and stretches from the coast to the slopes of Mount Epomeo. It is the smallest town of the island, but not the least well known! Its waters - of Legni, Capitello, Santa Restituta, Regina Isabella, the thermal sands of Santa Restituta and the steamy cave of San Lorenzo - are famous. 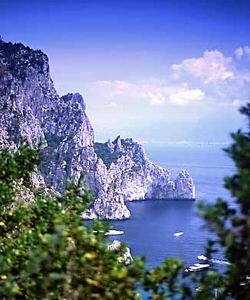 Lacco Ameno is famous for its large rock - known as the ‘mushroom’ because of its peculiar shape. You can see it just off the shore, a 10-metre high mass of green tufa, which is believed to have fallen down from Mount Epomeo. Important monuments to visit are: the Sanctuary of S Restituta with its annexed excavation sites and museum; the church of S Maria delle Grazie; the church of SS Assunta in Cielo; the church of San Giuseppe; the Tower of Montevico; Villa Arbusto with its park and the archaeological museum of Pithekusa. It is situated in the south-west of the island is made up of several ancient agglomerates set on delightful hills. Its hamlets have their own individual history and traditions. The population, which is mainly of peasant origin, needed houses far from the town centre in order to be nearer their land. Thus, the villages of Fiaiano, Buonopane and Schiappone (and its quarter San Pancrazio), Piedimonte (with its quarters Matarace and Molara) and Testaccio (and its quarters Chiummano, Piano and Vatoliere) were created. The town’s confines go from the Pilastri (coming from Ischia) and flow into the hills and up to the splendid Maronti beach found at the foot of Testaccio. They then disappear into the greenery on the outskirts of the town of Serrara-Fontana. Barano has always been renowned for its fresh clean air, its fertile lush valleys, the beauty of its valleys and hills, for its breathtaking views, the Olmitello and Nitrodi springs and its cultural traditions. The main monuments are: the parish church St. Sebastiano, the church of S.Rocco, the parish church of St. Giovanni Battista and the parish church of S Giorgio. Situated on the eastern side of the island it stretches from the hills of St. Alexander to the Aragonese Castle. The territory was divided into two main areas: Ischia Port, which used to be called the Villa of the Baths in ancient times due to the many spas and Ischia Ponte (Bridge), which was once known as the Borgo of Celsa. 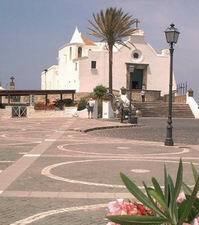 The name of Ischia was extended to the whole town recently, because at one time ‘the City of Ischia’ only applied to the so-called Aragonese Castle, where the island’s governor and bishop resided. A delightful and vivacious town, today this is the real centre of the island. Some of the white and multicoloured houses stretch along the edge of a lake which was once a crater. This was opened up to the sea by Ferdinand II of the Bourbons and became a safe harbour. The main attractions are: the Aragonese Castle, the Sea Museum, the Madonna delle Grazie e delle Anime del Purgatorio also known as S Pietro Church, the Cattedrale dell’Assunta, the parish church S Maria di Portosalvo, the church of the Addolorata, the Antoniana Library, the Seminar Palace and the Collegiata dello Spirito Santo church. The charming island of Procida lies like an undiscovered garden next to its vibrant sister islands Ischia and Capri. Flourishing gardens and fragrant lemon and orange groves bewitch visitors with their lush beauty. 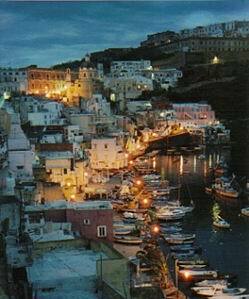 Procida is the smallest and oldest island in the Bay of Naples and is, like Ischia, of volcanic origin. Arriving at the harbour Marina Grande you'll have the wonderful view of fishers' houses in pastell colours, being reflected by the deep blue water. From here you can walk or take a threewheeled microtaxi up the steep road to the S. Maria delle Grazie church. 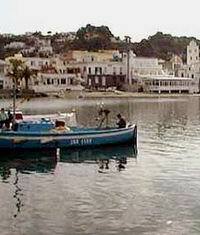 Here you can enjoy the view on the picturesque fishing port Corricella. Corricella was a vulcano crater, around which a characteristic, colourful town developed. 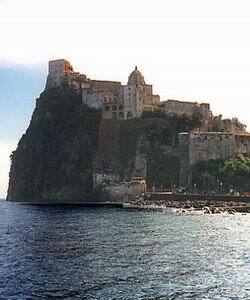 The Abbey church San Michele Arcangelo, the highest point on the island, lies closeby. It is worth a visit because of its library “Biblioteca dell’abbazia”. Further down in the noble palace, surrounded by palms and Bougainvillea, is the oldest nautical college of Italy (Istituto nautico Francesco Caracciolo). Along the southwest coast of Procida lie beutiful beaches, the yacht harbour Chiaiolella and the small island Vivara that is connected with Procida by a walkbridge. Since 1974 it is a nature reserve, accommodating rare birds and plants. Until today Procida has been spared from mass tourism, which can't be ascribed to the former jail, towering above the island. It is, however the inhabitants who want to restrict tourism, which is why only a few small hotels and private accommodation are to be found. The most restaurants are in the main town at the harbour. 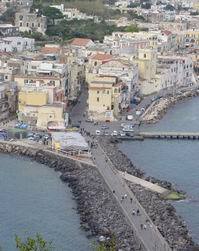 A few well-known films have already been shot in Procida (© PortaNapoli.com). Ischia is an island and is normally accessed via Naples by boat, so you will need to travel to Naples first, then take a boat to Ischia. The closest domestic and international airport to Ischia is Capodichino Airport just outside of Naples. If you are flying to Italy from the U.S., it is likely that you will stopover at Malpensa Airport in Milan or Fiumicino Airport in Rome, and then make a connecting flight to Naples. There are direct flights into Naples from Paris, London, Frankfurt, Amsterdam, Munich and Brussels, in addition to national flights from Rome and Milan. You can reach Naples by train. There are three main train stations in Naples: Central Station (or Napoli Piazza Garibaldi, which is located exactly under the Central Station), Mergellina Station, and Campi Flegrei Station. The train service from Rome is frequent, and the trip takes about two hours. There is a direct bus connection called Alibus which connects Naples Airport, Central Rail Station, and Molo Beverello harbour, no other stops. Service starts at 6.30 and stops at 23.30, trips each 30 minutes. Special fare 3 Euro. Regular bus from Airport to Central Rail Station / Piazza Garibaldi, line 3S: 1 Euro. Tickets are valid for 90 minutes and cover all commuter traffic (bus, metro, local trains, trams) in the region. To go from the Central Rail Station to Mergelina, take Metro line 2 towards Pozzouli. To go from the Central Rail Station to Pozzouli harbour, take first Metro line 2 to Montesanto (towards Pozzouli). Then in Montesanto, change to local train line "Cumana" direction Pozzouli. The "Cumana" Pozzouli station is near the harbour. The Metro line 2 stop in Pozzouli is far from the harbour. Taxi service is 24 hours a day. 7:35 Hydrofoil ALILAURO - Mon.-Sat. 20:00 Hydrofoil ALILAURO Naples - Mergellina Mon.-Sat. 7:10 Hydrofoil ALILAURO - Mon.-Sat. 9:10 Hydrofoil ALILAURO - Mon.-Sat. 14:05 Hydrofoil ALILAURO - Mon.-Fri.
20:15 Hydrofoil ALILAURO - Mon.-Sat. 5:50 Ferry MEDMAR - Mon.-Sat. 6:40 Ferry MEDMAR - Mon.,Wed.,Sat. 20:20 Ferry MEDMAR - Mon.-Sat. 6:35 Hydrofoil ALILAURO - Mon.-Sat. 9:20 Hydrofoil ALILAURO - Mon.-Sat. 10:00 Hydrofoil ALILAURO - Mon.-Sat. 10:15 Hydrofoil ALILAURO - Sun. 15:50 Hydrofoil ALILAURO - Sat.-Sun. 17:00 Ferry MEDMAR - Sun. 19:00 Hydrofoil ALILAURO Naples-Mergellina Mon.-Sat. 8:00 Hydrofoil ALILAURO - Mon.-Sat. 15:25 Hydrofoil ALILAURO - Mon.-Fri.
2:30 Ferry MEDMAR - Mon.-Sat. 4:00 Ferry MEDMAR - Tue., Thu., Fri.
5:00 Ferry MEDMAR - Mon., Wed., Sat. 7:50 Ferry MEDMAR Procida Int. stop on Sun. 19:00 Ferry MEDMAR - Sun. The transfer time between the mainland and Ischia will depend on distance between harbours, weather conditions and intermediate stops. Generally the hydrofoil will take less than the ferry. On the maximum distance with intermediate stops the slowest boat will take 1:45 hours. The fast hydrofoil will take around 40 minutes. Prices vary between arond 6 and 18 Euro. 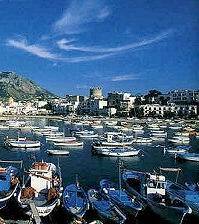 There are two other arrival harbours on Ischia: Casamicciola and Forio d'Ischia. They are well connected by bus with Ischia Porto. 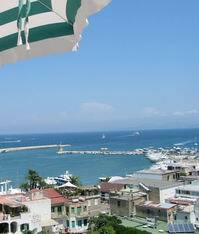 Jolly Hotel is in Ischia town, 400 meters SE of the harbour Ischia Porto. 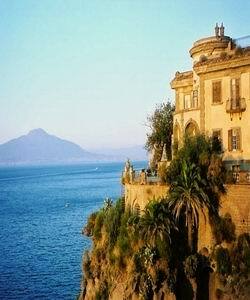 Ischia, the largest of the Neapolitan islands, lies off the southern arm of the Gulf of Naples, about 10 km. from the mainland. The coastline is very jagged with fascinating promontories and enchanting coves, stupendous bays and romantic creeks, some of which are only accessible by boat. 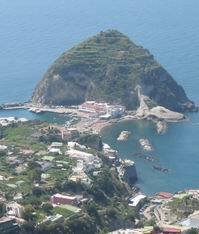 According to the most recent theories, the island of Ischia, has volcanic origins. In fact the Greek myth of Tifeo sees him as a volcanism personification: the rebellious giant who was condemned by Jupiter at the foot of the island of Pithecusae (Greek Pithekoussai), today's Ischia, erupting flames and hot boiling water and causing earthquakes by its movement. The island is divided into 6 village areas: Ischia, Barano d’Ischia, Lacco Ameno, Forio d’Ischia, Casamicciola Terme, Serrara Fontana. Called the "green island", because of its lush Mediterranean vegetation that typifies it, and "the island of health", for the wealth and quality of its thermal springs, Ischia is one of the most-visited destinations for tourists from all over the world, attracted by the fascination of a place that embraces nature, culture, tradition and modernity, history and myth.